‘Kathputli’ or Puppets are one of the art traditions which is not only old but very rich in content. Kathputli dance or show can be the references of Rajasthani ballads, local folk tales and also the folk songs. A great puppet show is like a light hearted story telling format in which audience get easily involved and moved by the performances of artists. This traditional art is been performed by the Rajasthani tribes or villagers. They visit several towns and cities and perform shows and in this way they earn their bread and butter. Kathputli is one of the ancient art forms and that has become an eternal part of Rajasthani culture and tradition. Puppets shows are been performed in each and every village shows, religious shows and any kinds of social gathering in Rajasthan. Several studies have been done on Kathputli and it is known also as string marionette art. People of Rajasthan are too much attached of their own culture and tradition and it is one of the reasons why the art of Kathputli and ‘Puppet Shows’ has still survived. 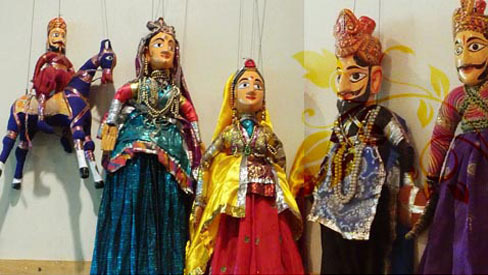 Different researchers strongly believe that folk tales which are being showcased in puppet shows, generally these portray the ancient lifestyle of Rajasthani tribal people. It is also a strong belief that the art of Kathputli may have originated from Nagaur or any other surrounding areas. Rajasthan is culturally rich state and the kings of Rajasthan were very fond of Art and Creativity. The kings of Rajasthan mainly encouraged the kathputli artists for activities like wood and marble carving, weaving, pottery and painting. Thus, we are blessed and can still experience such innovative creativities. Kathputli shows also help us to know several stories from past. These types of arts connect us with the roots and we feel blessed being born in such territory where the culture is so rich.